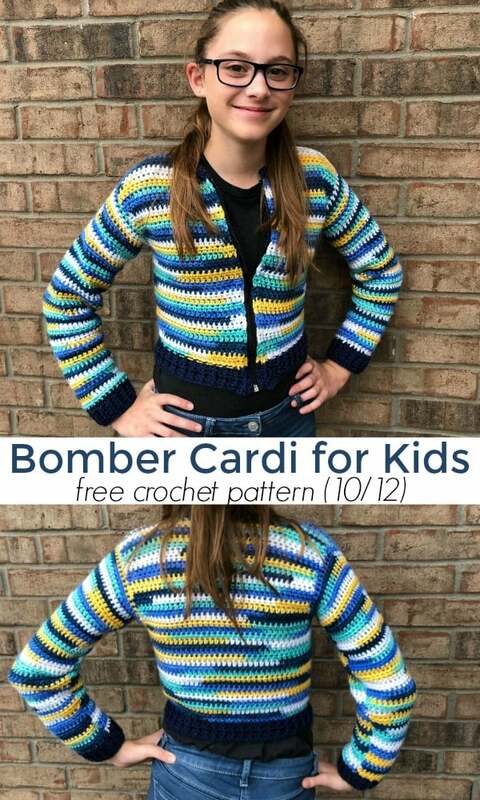 I hope you’re ready for the next size in the Bomber Cardi for kids series! 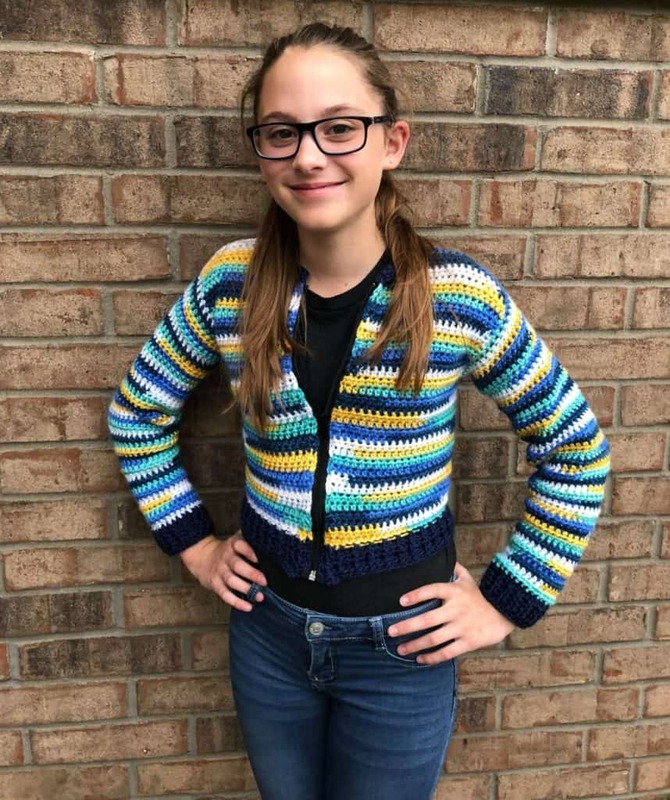 This free crochet pattern is for children wearing size 10/12. 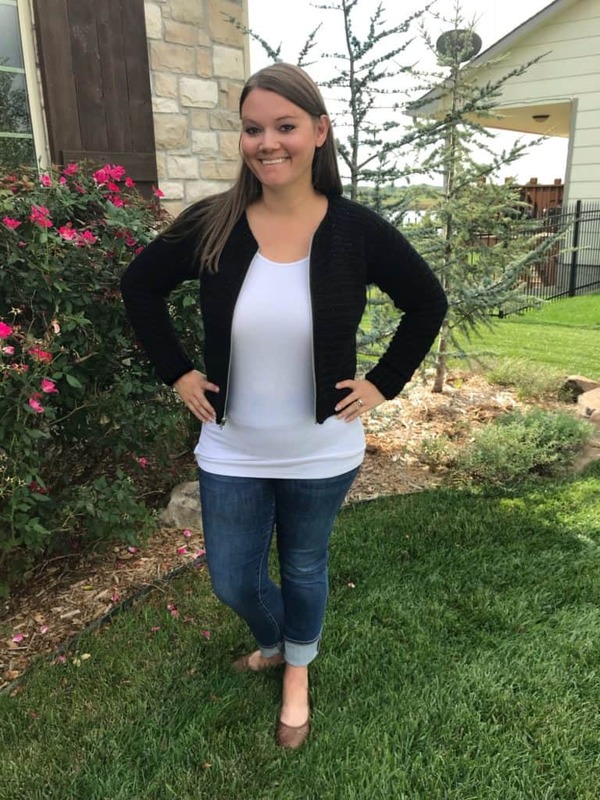 This cardigan is a bomber style, meaning that it is shorter than average and it runs a bit on the small side. This is all intentional. 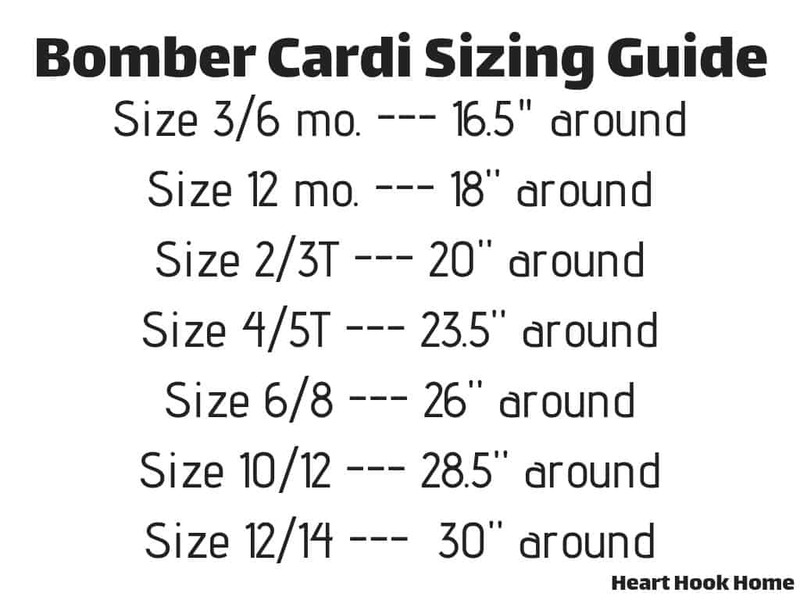 Please look at the sizing chart to determine which size your little one needs. If you’re wanting this for yourself, you can find the adult size here. 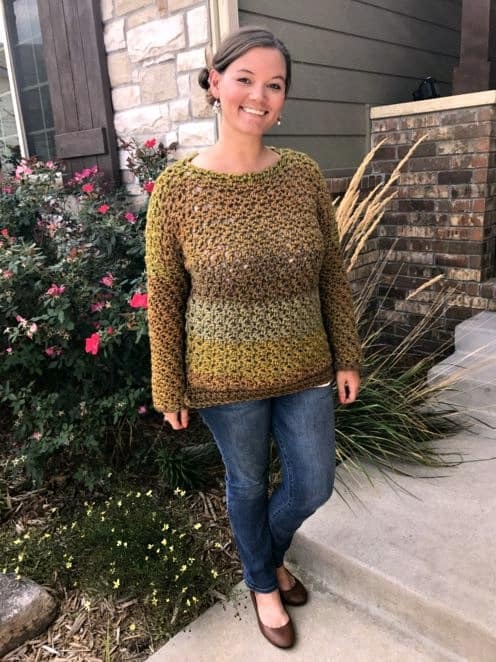 The original pattern uses Red Heart With Love yarn which is a soft, worsted weight, size 4 yarn. Jaime, my tester for this size, used Caron Simply Soft, which is also a size 4 yarn. 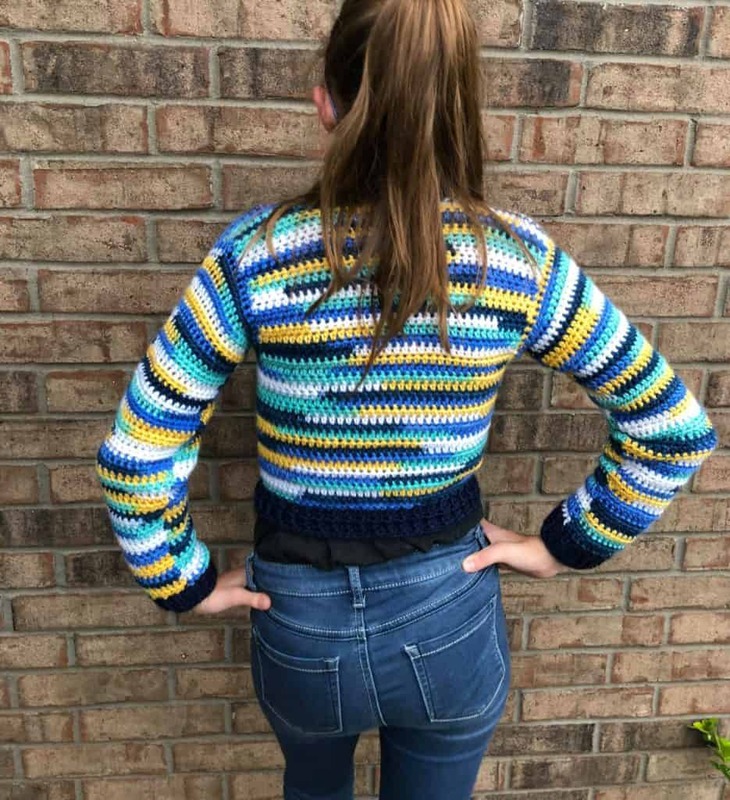 The adult size of this pattern is the Bombshell Bomber, and I just love it!! Attach yarn in 22nd st from left. 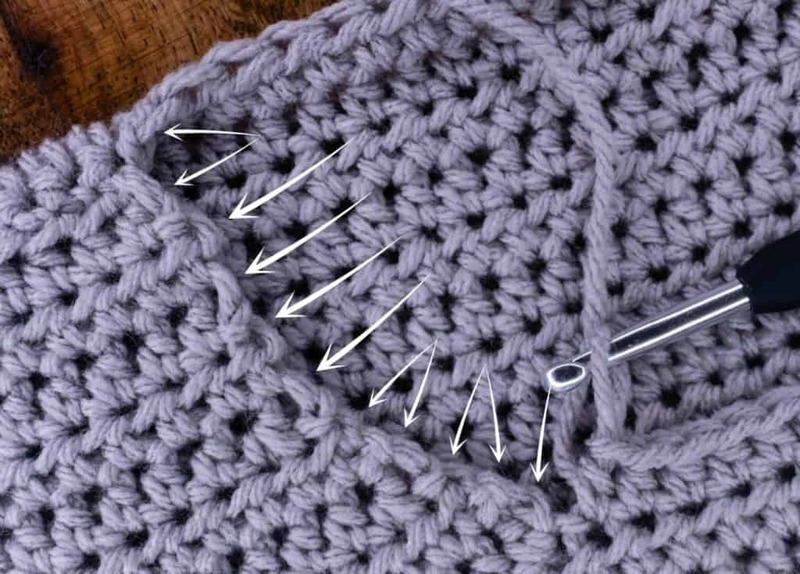 From the “right”, leave 3 sts open and attach in the 4th stitch. Fold fronts in and line up the top edges. Sew the shoulders using the Mattress Stitch for all stitches on both fronts. You should have 16 sts across the neck. Row 1: Attach at what will be the right lapel. Ch-1, hdc in same st and next 7 sts. Hdc in side of next st. Hdc2tog, hdc2tog (up decreases), hdc in each row end to neck. Hdc2tog (straddling the front/back), hdc in each neck st to opposite side. Hdc2tog (straddling the back/front) hdc in each rows end to decrease, hdc2tog, hdc2tog (down decreases), hdc in each st to end. Row 5: Ch-1, turn, sc in each st around, up around neck and back down to beg sc. Join with Invisible Join, weave in all ends. Attach yarn at bottom center of armhole. Row 43: Ch-1, turn, * fphdc around next, bphdc around next. * repeat between * * around. Fphdc around last. Join to top of first fphdc with sl st.
Row 44: Ch-1, turn, * bphdc around next, fphdc around next. * repeat between * * around. Bphdc around last. Join to top of first bphdc with sl st.
Row 45: Ch-1, turn, * fphdc around next, bphdc around next. * repeat between * * around. Fphdc around last. Join to top of first fphdc with sl st.
Row 46: Ch-1, turn, * bphdc around next, fphdc around next. * repeat between * * around. Bphdc around last. Join to top of first bphdc with sl st.
Row 47: Ch-1, turn, sc in each st around. Join with Invisible Join. If adding the optional zipper, you’ll want to watch this tutorial. Since there is no ribbing on this particular pattern, I just stayed consistent with my placement of the casing, going into the second stitch of each row. 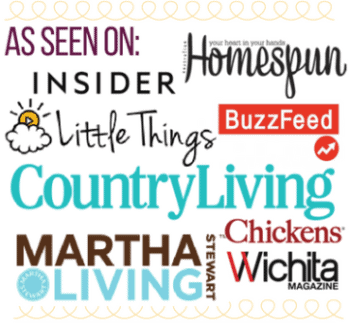 If you have questions, be sure to watch the video!